When I first started with photography, I used to wonder why my landscape pictures were not as awesome as the ones I'd find online. I thought that the more sun, the better! So I was always photographing at noon or just spontaneously without much planing. Until I realised that most of those great shots where either at sunrise or sunset. Yeah, it might sound obvious for some of you but I'm slow sometimes. I then started catching sunsets because if I can barely wake up early to go to work, how the hell am I going to make it on vacation? Luckily, the challenge of shooting amazing photographs seems to be bigger than my laziness (and believe me, I'm very lazy). There are some spots that face towards the east side and there's only one option - be there before the sun rises. The trick is to leave everything ready the night before, jump out of bed as soon as your alarm clock goes and have your flashlight ready in the hand. Always go with lots of time to make sure you get a good spot, specially if it's a touristic place (usually you're not the only crazy person hunting sunrises). To avoid being hunted by the sun instead of hunting it, I recommend you to use an app like Photopills to know where exactly and at what time the sun will appear . Oh, and forget about the weather forecast the night before. Just go unless it's really raining non-stop. Clouds usually run away when they see the majestic sun waking up. 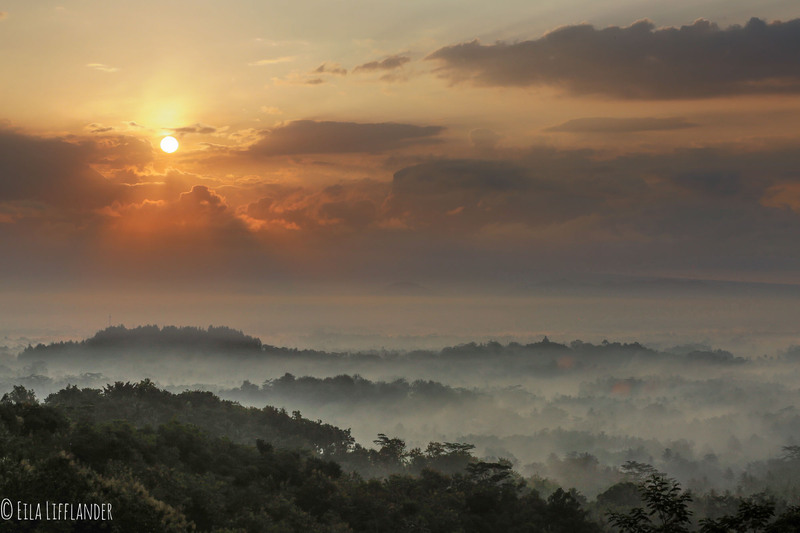 I leave you now with some must go sunrise photography spots in Central Java, Indonesia. Plus one sunset spot for those lazy asses. 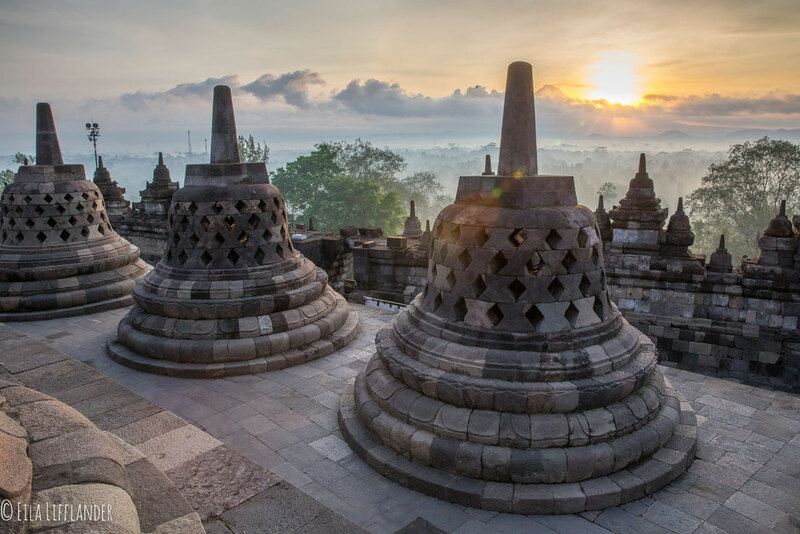 Do you only have one day and you don't know whether to go to Borobudur temple or watch sunrise from Punthuk Setumbu Hill? The answer is easy. 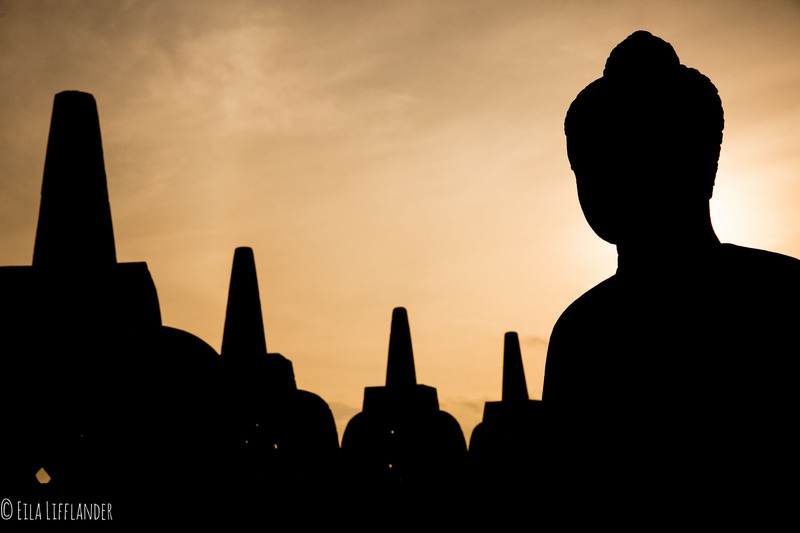 Go to the temple to experience the Universe in Buddhist cosmology under the stars. It is believed that you're at kamadhatu in the base, representing the sphere of desires that bound us. One floor up and you already start letting go your desires at rupadhatu. But it's only until you reach arupadhatu, the sphere of formlessness, where you completely free yourself from any name or form of desire. Once you have attained Nirvana, find your spot, set your tripod and welcome the sun. If you're lucky (as I was for five minutes), you can see mount Bromo in the horizon. The sunrise ticket is more expensive but it's definitely worth it. You pay Rp 450,000 and go in and out through the Manohara Hotel. Once the main entrance has been opened around 6am it starts to become mission impossible to take pictures without tourists in the back. That's the sign that you should start descending back to the hotel where they expect you with coffee and a little breakfast. We stayed in Borobudur only one night and then headed to Yogyakarta. Once we got there I started to get nervous because there wasn't much to do or photograph. 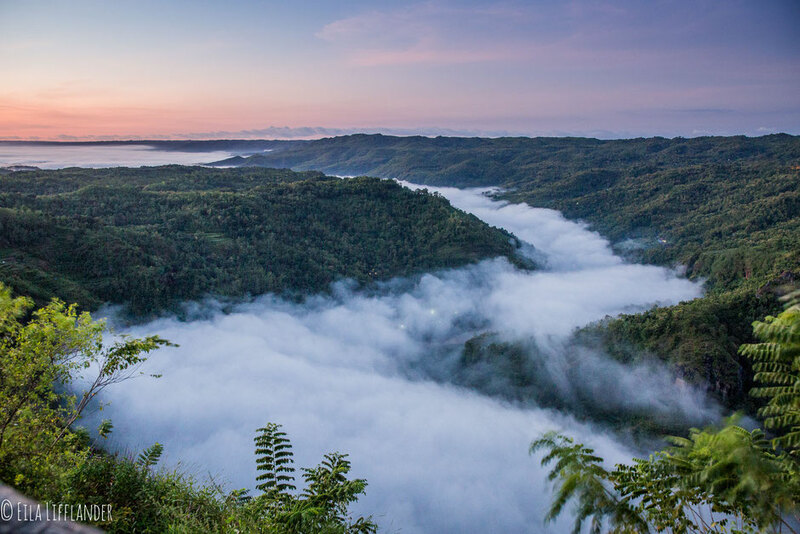 So I decided to hire a driver for the next morning and head to Punthuk Setumbu hill to catch a misty morning. 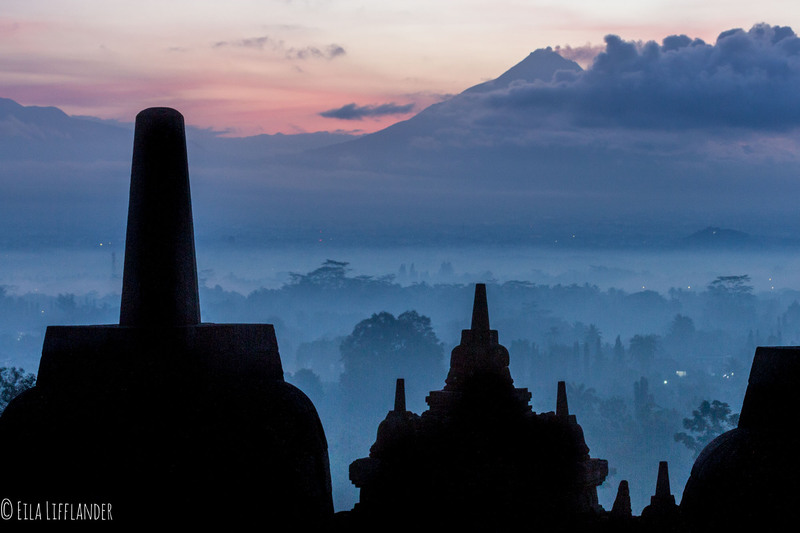 If you want to go there, stay the night before in Borobudur. 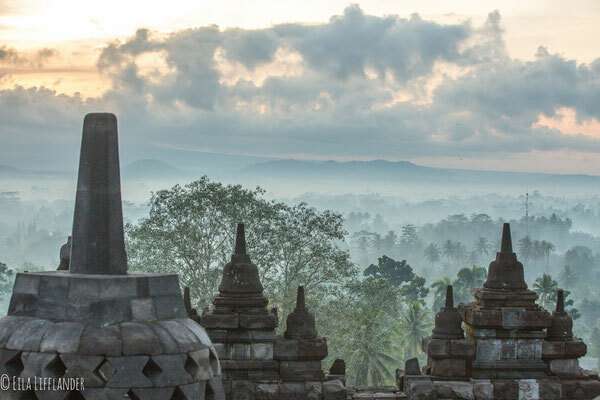 I had to wake up at 3:30 am because it was one hour driving from Yogya. But I was then the happiest person on earth when I got back to Yogya. It's pretty cool when you meet people from different countries on top of the mountain and you can talk about ISO, aperture, focus, lenses, and all the other dorky things that photographers love. I definitely recommend you to use a tele lens like the 70-200mm for this location. Do you see that little bump on the right side? 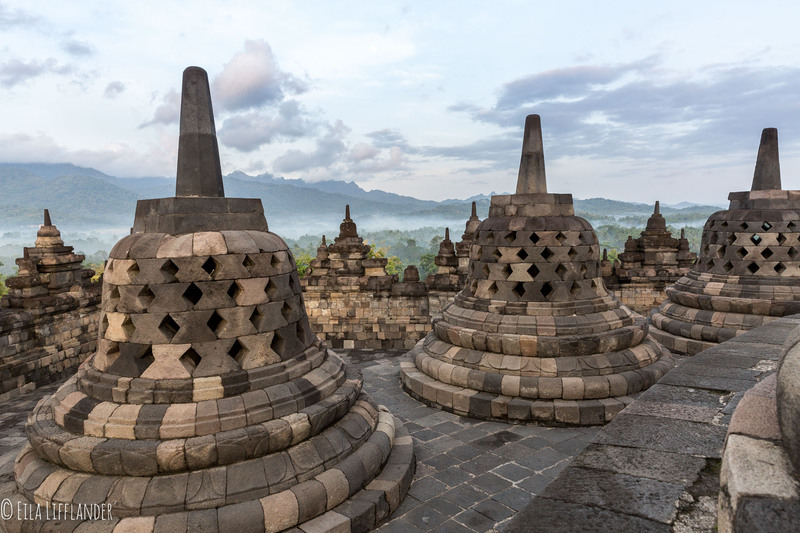 That's Borobudur temple. Some people prefer to start here and then go to the temple after sunrise. However, as I mentioned before, the temple gets really crowded after 6am. I strongly recommend you to spend two mornings around this area. 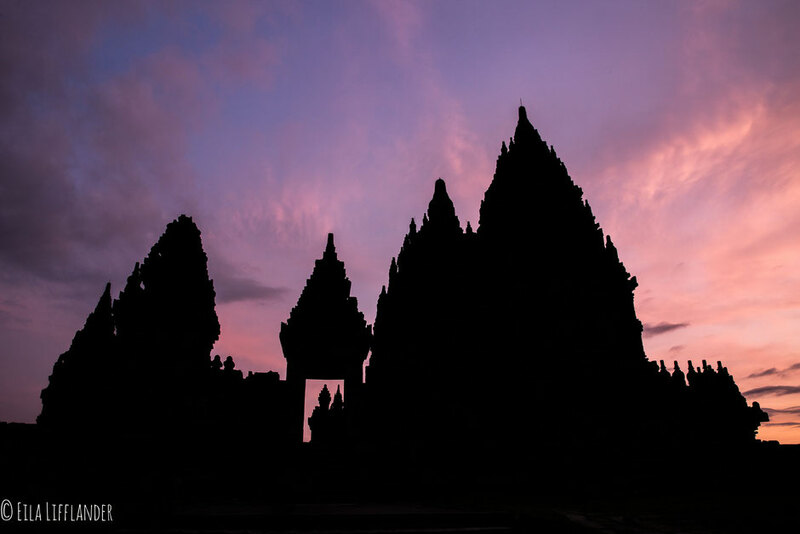 If you're looking for a photography spot for sunset, then Prambanan Temple is the place to go. We got there around 4pm so we had time to explore the temples. Prambanan was dedicated to the three great Hindu divinities - Shiva, Vishnu and Brahma- and to the animals who serve them - A bull, a swan and an eagle. We learned about this from three cute little Indonesian students who clearly memorized and then recited the story to every tourist they could catch. We first thought sunset wouldn't be amazing but suddenly the sky turned purple from one moment to the other.